If you find yourself creating multiple homeworks in a similar format, it might be worth setting up homework templates in order to save some time. When inside a class, click on the "homework" button to bring up the homework sidebar. You can either create a new homework and publish it, or view an existing homework. In the "view homework" menu, click on the pencil icon next to the homework you'd like to template. You will then be presented with the edit homework screen. To save the homework as a template, click on the "save as template" button. Now when you click on "set homework", clicking on the "use a template" button will display a list of your saved templates. You can filter the template results using the four filter boxes. 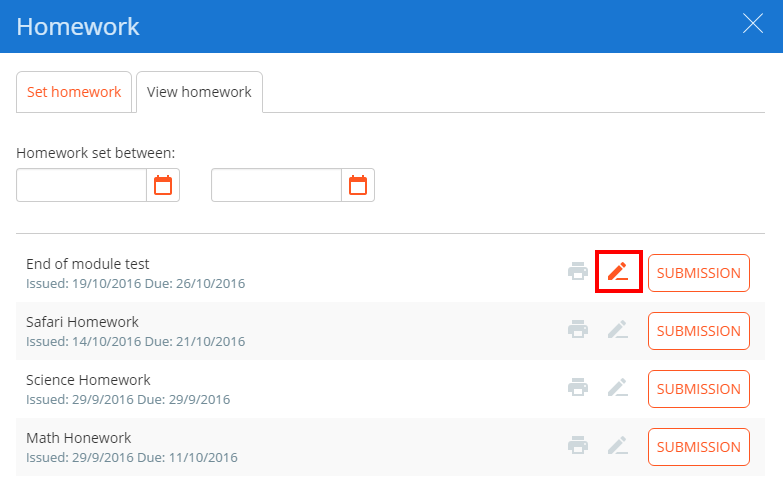 Clicking the "use" button will populate a new homework with the data stored in the template, allowing you to quickly produce repeating homework tasks.